A classic building that has outlived it's time. This was a working barn up until 1992 when this farm ceased to be an operating dairy farm and began it's transformation to producing forest products. 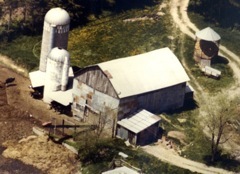 This picture was taken sometime during the 1970's or 1980's when the farm was still supporting a dairy herd. In the early 1990's my parents retired - after nearly 50 years - and dissolved the dairy operation. They began renting the land to a neighbor for corn and bean production. 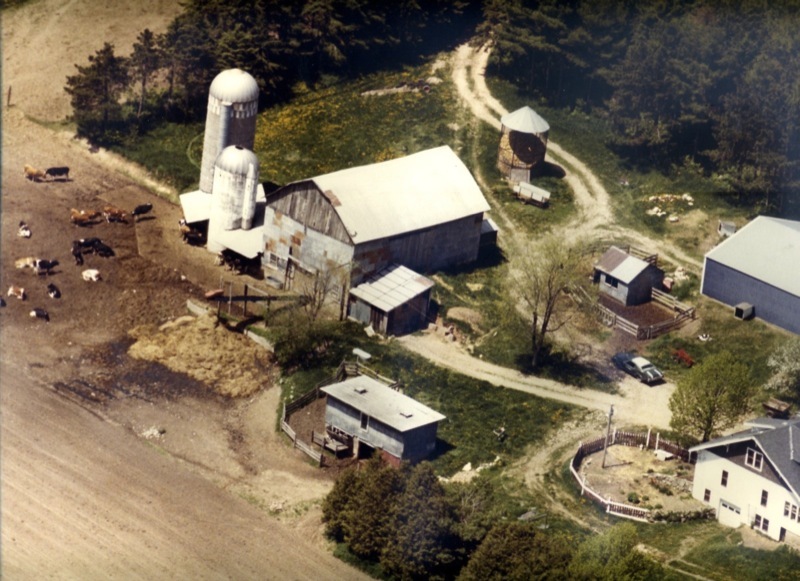 In the mid 1990's we realized that the rent we were receiving barely paid for the taxes and the cropping strategies used by the neighbor were mining the soil that my parents had worked a lifetime to build into; "... some of the best corn land in this part of the state." So we explored other options and finally decided that a better strategy would be to convert the farm into the production of high-value lumber and other forest products [ see Treenut site ] . It quickly became obvious that in order to preserve this barn we would have to invest in some fairly extensive repairs and maintenance projects. The most important and most urgent being a new roof. The current roof of asphalt shingles had been put on in the 1960's and although it had been patched over the years, it was missing shingles and had some fairly large areas where shingles were damaged and leaking. Estimates for the cost of replacing the roof ranged between $8.000 and $14,000 depending on the type of roofing selected. This was much more than could be justified by any imaginable future use for the building. And so it was with a great deal of reluctance that I decided to tear down the old barn and salvage whatever I could from the process; either for use in building a new structure or to sell to the highest bidder. And this had to be done soon if I hoped to salvage anything useful. Some History and Introduction - Old barn has outlived it's usefulness ... but not it's appeal. Deconstruction Stage III - Disassembly and salvage of the roof. Deconstruction Stage V - Disassembly and salvage of the basement. Postscript - Some closing thoughts.